after a few inquiries i thought i'd just put together a very simple, very quick demonstration of preparing an existing silverlight 1.0 application for release candidate. i've posted previously about the preview sdk and breaking changes and this screencast walks through taking two simple samples from the silverlight.net site and prepping them for the release candidate. you can view the screencast here. now, i know that every person's silverlight application may vary, but there will be common things you have to do. this first screencast shows those very common things that likely everyone will have to change. i'll post up some more conversions of more involved samples shortly. but for now, this should answer the 'what do i do first?' questions some may have. these are silverlight 1.0 samples, using visual studio 2005 as the development environment. HELP: i'm still trying to figure out the best way to deliver media to subscribers (i've posted the screencast on my *cast feed as well), so i've also made an iPod version (m4v) available to anyone. if anyone has good ideas on enabling a single feed to please everyone without bogging individuals down with formats they don't want/can't use, please let me know -- i'm a noob. 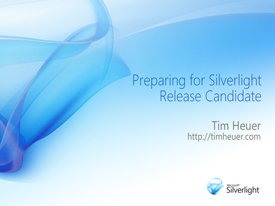 i want to help everyone be successful in preparing your samples/projects for silverlight release candidate. i keep my contact lines pretty open. my email and instant messenger information is listed on the contact page of my blog, which i've updated. i've also added a 'call me' button on the site so that if you want to directly reach out to me, you can. it connects to me, my cell -- not an office or main line. call anytime (i can't promise i'll answer at 3am though ;-)).